A vacation to visit family in Boise happened to fall on Father's Day. As it happened, my cousin recently celebrated the birth of his first child, and therefore this Father's Day-- his first-- had some special meaning. Our wonderfully understanding wives encouraged us to go hit a stream and enjoy ourselves for the day. As luck would have it, I happened bring waders and boots. Coincidence? 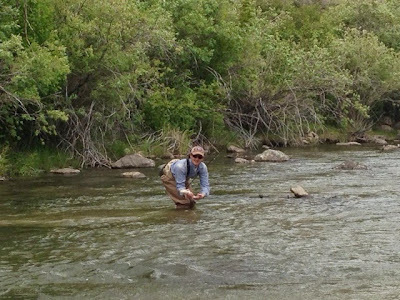 A borrowed five-weight and a few flies from a Boise shop were all the gear needed for the day. 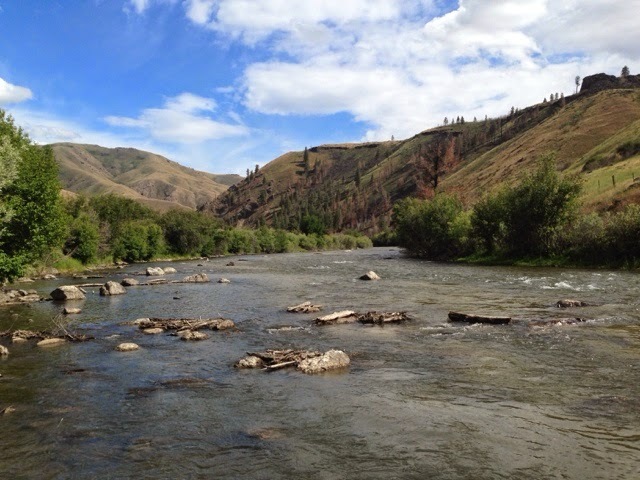 We hopped in the car and drove a bit over an hour to the South Fork of the Boise River. 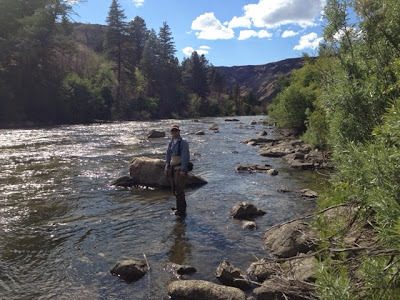 The river is a nice wadeable tailwater, a canyon cut through the high desert. Above, grass and sage dominant. The river is lined with cottonwoods and bushes. Gentle runs, riffles, and faster rapids are dotted along its length, and each of these sections hold wild rainbow trout. Cloudy skies and temps in the high sixties were promising. I like clouds because the fish are less shy. We needed the temps to warm enough for the bugs to hatch, though. We were hoping for two big insects to bring the trout to the surface. The first were cicadas. We could hear them signing in the cottonwood stands as we drove the dirt road along the river bank. Figuring that some of these might be blown into the river by the occasional gust of wind, I tied on a foam cicada pattern the size of a couple peanuts still in their shell. 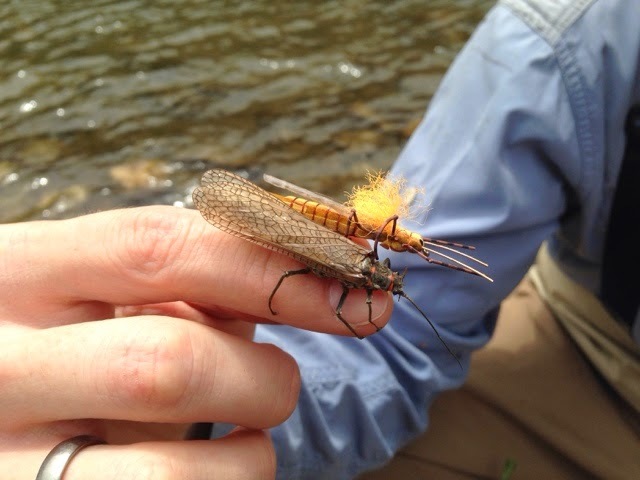 Jason opted for the second pattern, the salmon fly. 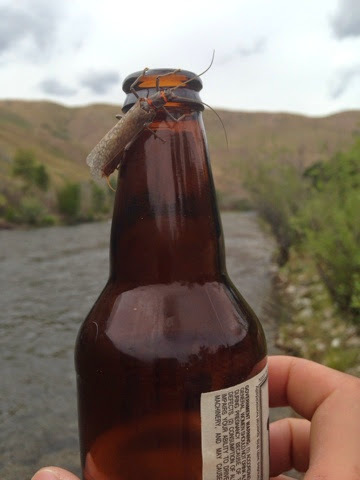 These large stoneflies hatch this time of year, crawling from the river bottom to the shore where they shed their skin and unfold new wings to dry in the sun before taking flight. 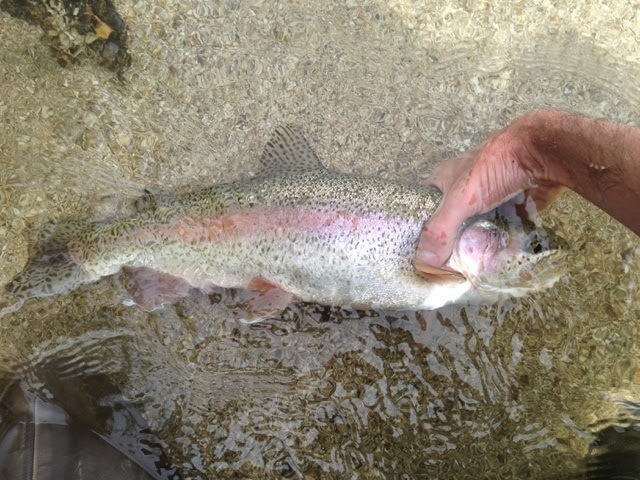 Nearly the size of my pinky finger, they make a pretty irresistable meal for a hungry trout. We fished a gentle riffle section for an hour or so without getting a hit. A father-son duo in a pontoon boat came down and hooked a fish from a deep run on the opposite bank. The son was at the oars, and the dad was throwing big subsurface flies. Another great Father's Day in progress. Since the action was slow, we paused for lunch. Sitting on the bank, we watched a small caddis hatch in porgress on the far bank. We noticed salmon flies pulling themselves up on the rocks at our feet, a positive sign for the afternoon. Maybe the warmer temps would trigger something. Jason suggested that we move downriver to see if the hatches started earlier there, a somewhat typical pattern. It's a true pleasure to fish with someone who knows their game well. Jason pulled the car in next to a likely patch of water. Rather than splash right in, we fished the water we wanted to wade through. About six casts in, while I was talking and not paying attention, I got my first tug of the day. "They're heeeeeee-ere..."
Not paying attention, I botched the hook set. However, it was the shot of confidence that we needed. We started moving upriver, Jason along the near bank and me up a bar toward the middle of the river. Jason had the first fish. It had a fat belly on it, the kind that droops over your hand as you support the weight of the fish. These fish were well fed. The big bugs were making them aggressive. We left landing nets in the car, which made landing the fish a little tricky. Unfortunately, landing the fish cost him a broken tip section. Thankfully we weren't far from the car and a spare tip, and the fish was worth it. 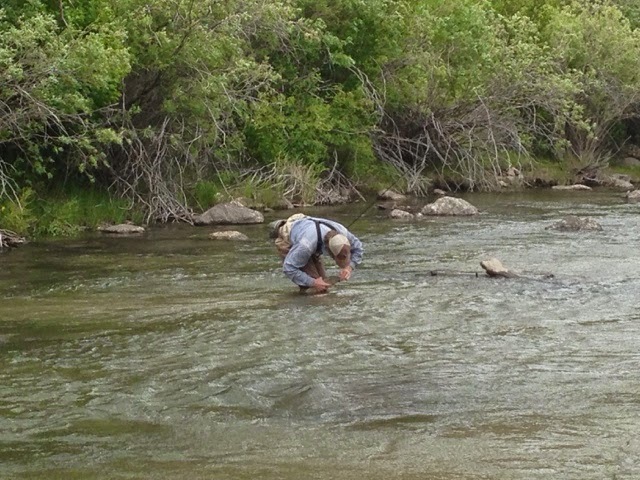 Jason hopped upriver a hundred yards and the two of us started working up. It was great water-- bouldery with lots of pockets, varying depths, and currents that ranged from a crawling pace to a fast run. Likely trout lies seemed to be everywhere. The pocket water made for short, technical casting. Anything longer made getting a drag free drift for more than a few seconds nearly impossible. Instead, it was a fun game of stealthfully moving into position and dropping a short cast into the current seam, hole, or gut that you wanted to work. The fish aggressively took the big flies we offered. 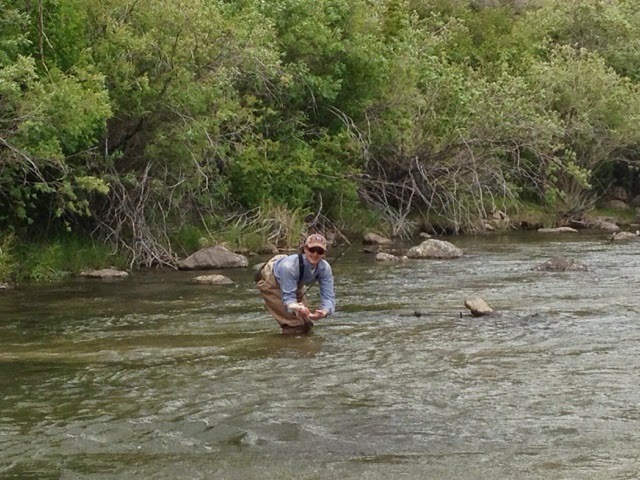 It was fun to prospect with a dry fly-- not something a salt water guy normally gets to do. By the end of the day, I'd landed, broken off, or missed hooksets on enough fish to have had my fill. The sun came out from behind the clouds. The spectacular nature of the place takes over and the fishing no longer matters.